1. In a large cast-iron pot, sauté the onion in olive oil until translucent. 3. Add the canned tomatoes and the bay leaves. 5. 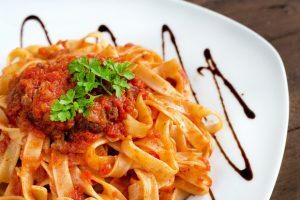 Gradually add the garlic, dried chili, cinnamon stick, cloves, sun-dried tomatoes, anchovies (or anchovy paste), oregano, basil, sage, red wine vinegar, and salt and black pepper to taste. 6. Simmer on low on the stovetop with the lid of the pot slightly ajar, and stir occasionally for at least two hours — or longer if possible. The longer you simmer this, the more tender the meat will become. The ragù is ready to eat when the meat has totally fallen apart and most of the liquid has been absorbed by the meat. Take out the cinnamon stick and bay leaves before serving. 7. Serve over the pasta and top with grated cheese. Accompany with some crusty peasant bread and a good red wine, preferably a strong Italian, like Amarone or Barolo.